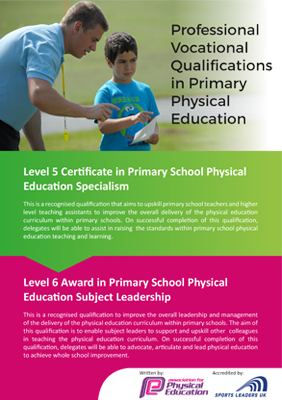 The Level 5 Certificate and the Level 6 Award are new Professional Qualifications in Primary School Physical Education Specialism and Subject Leadership. The Val Sabin Professional Learning Centre is now delivering these new Professional Qualifications for Primary School teachers and Higher Level Teaching Assistants and Teaching Assistants with extensive experience. The 8 separate training days with assignments and assessments have been developed by the Association for Physical Education (afPE) with Sports Leaders UK to be completed in one to three years. These courses and qualifications are an effective use of some of the Physical Education and School Sport Premium funding intended for the up-skilling of Primary School teachers. One aim is to ensure a sustainable Physical Education legacy with a qualified PE specialist in each Primary School. 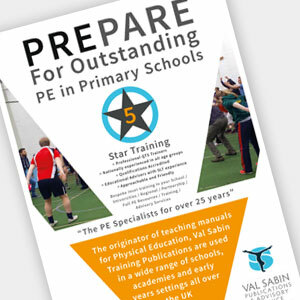 As a recognised Professional Learning Centre for both the Level 5 Certificate in Primary School Physical Education Specialism and Level 6 Award in Primary School Physical Education on Subject Leadership qualifications, Val Sabin Training can arrange attendance on courses in various regions. These qualifications have been designed as work-based professional development with additional out-of-school practical subject courses. The courses cover the full breadth of the Physical Education Curriculum from Early Years through Key Stages 1 and 2 all with planning, assessment and inclusion. The Val Sabin arranged courses come complete with comprehensive teaching manuals as part of the process in achieving outstanding planning, teaching and learning.